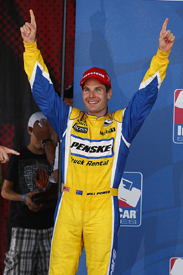 Signed as a stop-gap while Helio Castroneves was on trial, retained on a part-time basis because he was too quick to let go, Will Power outperformed his full-time team-mates to claim his first IndyCar Series win on a Penske dominated weekend at Edmonton. Many in the paddock were keeping an eye on events over at the championship's spiritual home Indianapolis, where Juan Pablo Montoya looked set to take his first NASCAR victory on oval before a penalty allowed champion Jimmie Johnson to take the spoils. The two-wheeled world delivered its most eventful MotoGP race of 2009 so far, as Donington Park's swanswong featured crashes for both Yamahas and a bizarre tyre gamble remove Ducati from contention, allowing Andrea Dovizioso to take his first win under massive pressure from Colin Edwards and Randy de Puniet. A potentially pivotal weekend in GP2 saw Nico Hulkenberg leave Hungary with an extended points lead thanks to his third straight win and more disasters for Romain Grosjean. Giedo van der Garde took his maiden win in race two. Matt Beer starting freelancing for AUTOSPORT.com in the first week of its existence in 1999, and spent the next decade-and-a-half dovetailing increasing amounts of time contributing to it with working for other Haymarket motorsport websites, UK national reporting, co-managing award-winning Edinburgh Festival Fringe theatres, racing driver and team PR, and getting some degrees, plus contributions to an AUTOCOURSE Champ Car yearbook and the FIA Institute's in-house magazine. Now deputy editor of AUTOSPORT.com, he also oversees AUTOSPORT's talent development programme for emerging motorsport writers.